Structured Data of New York is building Thumbstacks.com, which enables users to create and run slideshows in just about any Web browser. The idea is to build presentations and then publish links, which can be viewed by anyone, anywhere. A remote meeting feature enables users to show their stuff in real-time. Still in the development stages, the Thumbstacks app—which supports FLASH, AJAX, Flickr and live plug-ins such as Google maps—offers basic presentation functionality. Developers are working on drawing tools, animation, audio and video, according to the company’s blog. You can test drive it. Testing was another area that began to evolve with the advent of multi-tiered client/server architectures, distributed systems and object-oriented technologies, according to a series of articles. “The proliferation of personal computers has changed software into a consumer product found in homes, as well as the office, and users expect it to work as well as any other appliance,” said Alka Shah Jarvis, president of Bay Area Quality Assurance Association and senior software and service engineer at Stratacom. Cutting and pasting are standard desktop functions, so why not extend that same model to the Web? Lotus Notes creator and now Microsoft’s CTO Ray Ozzie has asked a MS conceptual dev team, headed by his brother Jack, to work on a new open standard called Live Clipboard. Ozzie acknowledges in his blog that others outside of Microsoft have bandied about similar ideas. Still in draft spec stages, Live Clipboard would allow users to cut and paste dynamic data between Web pages, Web sites and desktop apps. As Ozzie sees it, calendar and contact information would appear in familiar MS Office formats. The idea behind Live Clipboard is simple: XML feeds are associated with content rather than Web pages or sites. Germany’s Eleksen is touting fabric keyboards to OEMs for mobile computing devices with USBs or Bluetooth connections. 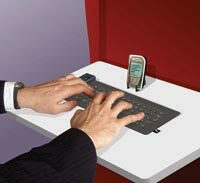 The keyboards, which are the same size as standard laptop and desktop models, are based on ElekTex. That’s the company’s core technology, which uses sensors and electronics to create customizable fabric touchpad interfaces.